The kidnappers were Islamic extremists, the released Estonians said and had urged them to convert to Islam. 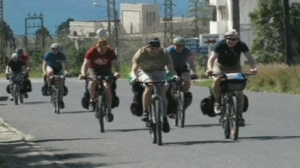 The seven men, Madis Paluoja, Jaan Jagomagi, Kalev Kaosaar, Martin Metspalu, Andre Pukk, Priit Raistik and August Tillo , were abducted March 23 after they entered Lebanon on bicycles. They were released in the Bekaa region of Lebanon to a French delegation, the local LBC and MTV television channels reported Thursday. They also said during the press conference that they felt that they were being followed soon after arriving in Lebanon on board their bicycles. When they were a short distance from Zahle, two cars hit two of the cyclists, while a third was hit repeatedly by the car door, reported As Safir. The armed assailants then ordered them to get into a van that soon arrived at the scene, continued the Estonians. In the van, they were stripped of their mobile phones, except for Paluoja who was tempted to send a message to his wife informing her of their ordeal, but he opted against it. He estimated that they were kept in a hideout in Lebanon and another in Syria, noting that the kidnappers managed to cross between the two countries undetected by the authorities. He added that all seven of them were never separated, saying that it was likely because the abductors did not have enough secure hideouts to keep them in. During the second week of the abduction, Jagomagi stated that the kidnappers aggressively ordered them to verify media reports that four of the Estonians were Jews or from Denmark, homeland of a cartoonist who sparked Muslim ire in 2005 for a caricature of the Prophet Mohammed. The men said that they were kept in a modest hideout, but they never felt hungry. At one point, they were kept in a warehouse with a metal door and a window with very little sunlight coming through. The kidnappers allowed them to occasionally open the window, they continued. They only received word that they will be freed only hours before their release at dawn on Thursday. The Estonians said that they were transported to the area of Sahel al-Taybeh from Syria where they were given a mobile phone and an Estonian number, which they were ordered to dial at dawn. The abductors then left them in the isolated location. So far 14 individuals have been charged with being involved in the abduction, five of whom are still at large, said the daily. The freed men appeared to be in good health. Asked if they had been well-treated, Paet responded: “There is nothing human about being taken hostage”. The abductors — believed to be a previously unknown group called Haraket Al-Nahda Wal-Islah (Movement for Renewal and Reform) — had reportedly demanded a ransom. According to Lebanese media reports the Estonian government paid the kidnappers 10 million euros to win their release. “There are always costs involved with such a joint (release) operation,” Paet told a news conference in Tallinn last Thursday. The MP commended the Internal Security Forces (ISF) Information Branch for having a key role in the release of the Estonians. Better they shot these cowards for converting to their religion. Didn’t say that. It said ‘urged’ – not that they did.